Now onto the purpose of today's post, which is to participate in the fabulous blog hop hosted by none other than Lilly McFerrin (super cool chick and awesome critiquer). 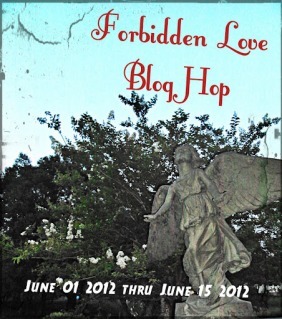 The theme is Forbidden Love and there are prizes involoved including a free query critique to any and all who enter. So get on it! Rena Lowrey stood on the edge of her world. The train rickited by not ten feet in front of her, stinging her face and causing her brown hair to fly into her nose and stick to her lips. The horn blared as the last car passed, pushing her backwards with the force. Chase Graten stood on the other side, that devastating half smile crossing his lips. His skin was dark with the sun and his shirt frayed at the edges. Proof of just how far apart his world was from hers. He crossed the tracks, sweeping Rena into his arms and spinning her around. Rena sighed into his shoulder. "How long do you think we have?" "A minute, two if we're lucky." He set her on the ground and took her hand. "Ready to run?" "Do you think they'll catch us?" "Most likely, The Watchers won't let us get far." Rena nodded. She knew how dangerous it was to love someone on the other side of the tracks. It meant giving up her life of safety and privilege for the life of a fugitive. She pulled at his hand and their legs started to move. A huge winged creature swooped down from the sky, scooping them up in his leathery arms. Rena squirmed and kicked, but soon they were too high off the ground. Chase found her arm. "I will always love you, this doesn't change anything." She wanted to tell him that she loved him too, but the wind caught in her throat and the words wouldn't come. The Watcher dropped them into pile of sand and Rena had to claw her way out, coughing in sputtering. Chase was by her side in a moment making sure she was okay. “We’re alive,” she said. But she didn’t know how long it would last. No one ever survived when The Watchers came for them. Congrats on finishing your book! It's such a great feeling! Wow! What a great piece of writing. Is this an except from something, or a short story? And CONGRATS!!! on finishing your novel. Good luck with querying! Congrats on finishing your MS! I hope querying is successful for you. You're well ahead of me. Congrats on finishing the book!!!! Congratulations on finishing your book. That's big. Cheers to you and best of luck finding the perfect home for it. Forbidden Love - LOVE it! Definitely got me hooked. Is this the beginning of your next novel? Oooh, I know that 'finished novel' feeling, hope the querying goes well (never had the courage to keep that end of the bargain!). Loved your 'wrong side of the tracks' take on Forbidden Love, it started out like a traditional tale then pulled its punches as the Watcher arrived! Hope they manage to outwit them and survive...like no one else ever has! congratuLAtions! way to finish! good luck w/queries! and this piece was outstanding! Loved this!! It was such a short window but you created so much depth to your story. I really want to know where this one goes!! Congrats on finishing that book! And goodluck with the query! Also, I enjoyed your story, especially the ambiguous ending. Good job! Congratulations on finishing your book! :) And on 200 Followers as well, since I see you've reached that number. Yay!!!! So exciting to finish a book :) And, thank you so much for entering the hop and sharing this creative piece with us! You rock!!! Hooray!!! The best feeling is when the book is done! Congrats!!!! Congratulations on completing your book. The ending leaves me wanting to read more. Gosh, that was cool! Who or what are The Watchers? Where is this? Who are they? So many questions! Actually for a while there at the beginning, you had me picturing a "Bonnie and Clyde" type duo, I figured they were a couple about to be on the run from the law!